Welcome to Outdoor Zone (www.outdoorzone.ie) � your supplier of airsoft guns and more! The shop was established in 2016. We can offer you the large selection of best products at very competitive prices. Our offer includes i.e. My airsoft adventure began in 2011 and very quickly become my passion and style of life for next 7 years. I have always wanted to set up my own shop with Airsoft guns in Ireland. As a player, I have always seen a gap on Irish airsoft market. Using my experience about gear and airsofters needs I decided to fill this gap and create www.outdoorzone.ie, my own online shop based in Dublin. As an experience active airsofter, with no plans of retirement :), I am always happy to help and give some advice. 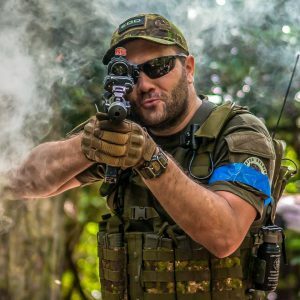 Lots of airsoft gear I sell is tested on the field by me or my team members. Here, on www.outdoorzone.ie you will find a rich selection of affordable airsoft equipment. I am constantly trying to expand my offer of airsoft guns and other products. Check our catalogue of Gas Blow Back replicas, Automatic Electric guns, airsoft grenades, pellets, airsoft tactical gear, airsoft upgrade parts, airsoft accessories and more! The outdoor zone can provide you with products of the world�s best brands like Tokyo Marui, Mad Bull, G&G, Specna Arms, E&L, WE, Helikon tex, ESS, Bolle, CYMA, Amoeba airsoft, SHS and lots more. I can offer you safe terms of payment, quick delivery and local pickup option. I am also well aware of the legal requirements, that is why we can offer you airsoft guns under 1J (328 fps) legal power limit. Almost 10 years in airsoft community gave me a lot of valuable knowledge and experience and I never lost my passion, enthusiasm and energy. I am constantly looking for new, interesting brands and products. I try to create my own custom sets made by airsofter, for airsofters. I am also trying to be active in the airsoft community in the country. Give them my support and sponsor some local events.